HAC: New board structure. When Human Trafficking is too close to home. Hotel Equities has 15 Canadian properties. Personnel changes at Marriott. 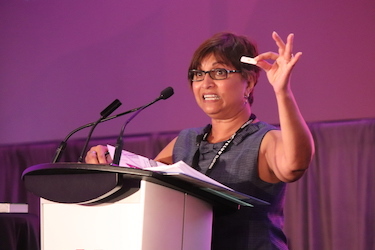 TORONTO — The Hotel Association of Canada annual conference, held Feb. 27 and 28 at the Delta by Marriott Hotel Toronto Airport, featured Suhana Meharchand as host. The HAC has updated its board of directors to be more inclusive — because it's 2019! COLLINGWOOD, Ont. — On Tuesday, Feb. 5, the Ontario Provincial Police informed Larry Law and Don Buckle of Living Water Resort that the Mexican cleaners they had hired through an agency were victims of human trafficking. Their response was the start of a community effort to help the victims. TORONTO — They've been in Canada for just over a year, but Hotel Equities is now manager of 15 Canadian properties. CLN talked to Joe Reardon, chief development officer, about their deal with APX, and how they are managing their Canadian expansion. TORONTO — Tourism Toronto's loss is Marriott's gain. Johanne Belanger has joined Marriott as vice-president, field marketing, U.S. and Canada. Marriott announced changes to its Canadian development team, including the departure of Manlio Marescotti. TORONTO — She's a Dragon on Dragon's Den. She started five companies before she was 33, is ranked one of WXN's Most Powerful in Canada and listed as a Forbes "Millennial on a Mission." Michele Romanow told the HAC conference about her start in the caviar industry, and how she learned reality can be very different from the business plan. ST. JOHN'S, N.L. — Greg Oates of NEXTFactor Enterprises kicked off the HNL Annual Conference and Trade Show. HNL signs MOU with Indigenous Tourism Association. HNL Tourism Excellence Awards Gala. ORILLIA, Ont. — Resorts of Ontario will hold its annual conference and trade show at Casino Rama and Fern Resort from March 31 to April 2 titled From Ordinary to Extraordinary — Tools for the 21st Century. RLHC unveils RLabs. Accor launches Tribe brand. Tourism HR Canada Labour Issue Survey. Expedia on Canadians and vacations. Exodus studies ethical tourism. TORONTO — CGLCC, Canada’s LGBT+ Chamber of Commerce, in partnership with Tourism HR Canada (THRC), will be conducting LGBT+ Inclusion Training sessions for the tourism industry throughout the month of March, 2019. World's largest Residence Inn opens in Calgary. Winnipeg gets a Residence Inn too. Microtel ribbon cutting in Mont Tremblant. Coast to manage Blackcomb Lodge. IHG's debut in Pacific Northwest. Kingsbridge takes over Qualicum Beach Inn. Royal Flavour at The Malcolm Hotel, Canmore. TORONTO — Despite the full day of heavy snow, the 2019 Canadian Hotel VIP Leaders’ Dinner was a resounding success with its second year at Ruth’s Chris Steakhouse by the Toronto Airport. See all the photos on CLN's Facebook page. Accent wins for putting employees first. UofG students win in Tri-University Hospitality Competition. BCIT wins student case competition. Skål Hamilton celebrates 40 years. Westin Grand Vancouver turns 20.